I'm back in DC (take that, ash cloud!) and recovering from a truly amazing trip. In a quick review of the highlight reel, I give you the first song we heard during our trip, in a Prague cab. It's too easy to note how fitting it is, but, well... I'm easy. Now here's one of the last images from the trip - the two people who brought us to this amazing corner of the world. Everything that happened in between will come, but for now - whew! What a trip. Such a pretty picture. Glad you had a great time! 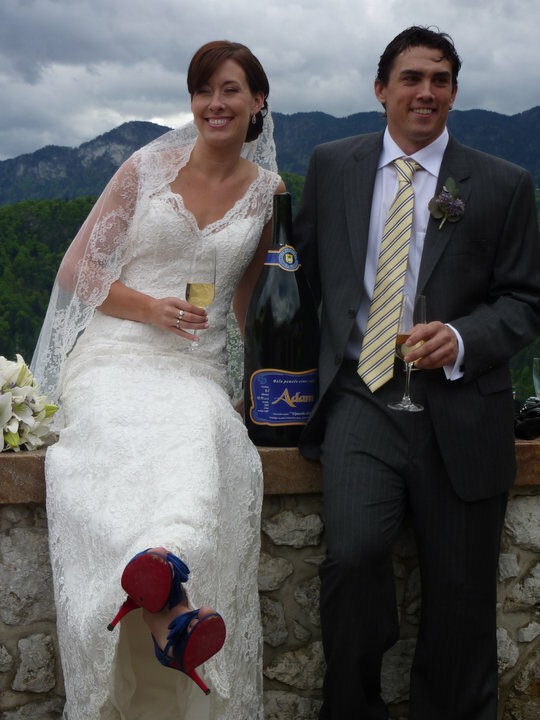 LOVE that the bubbly label matches her blue shoes to perfection... those are the kinds of details you just can't plan! Can't wait to hear more! They are such a beautiful couple! The shoes! The dress! The handsome groom! What an amazing place for a wedding! Welcome home! I hope yall had a blast. Such a gorgeous couple! I love the pics you put up in FB- so incredible. However, I am dying to see photos of your red dress! I LOVE her shoes! And her dress is beyond gorgeous!